During the time when the gods walked this earth, the Rasakinda plant grew. 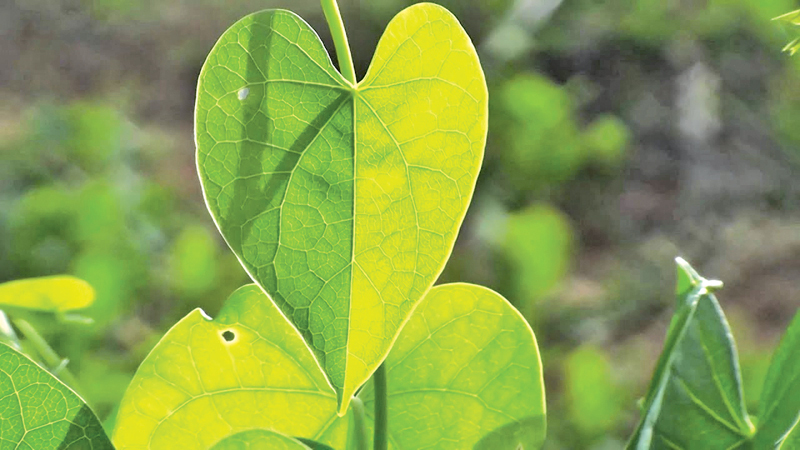 It is a vine with many powers and is one of the most important medicinal plants in Ayurveda. Green Thumbs speaks to Institute of Indigenous Medicine, Department of Dravyaguna Vignana, Senior Lecturer, Dr. S.D. Hapuarachchi who spoke about this plant that produces the all- important nectar that is called ‘divine’ by some. Hapuarachchi narrated a story from Ramayana that most readers of Ramayana might be aware of. It is a tale of an epic and mighty war between Lord Rama and the terrifying demon Ravana. Lord Rama pleads to Lord Indra the storm god, with powers over lightning and thunder to resurrect the beasts of his army that laid down their lives in the battle against Ravana. Lord Indra granted Rama’s wish and showered down nectar from heaven over the beasts and brought them back to life. When these drops of nectar fell on the earth it created the Rasakinda. You may choose to believe this story or call it simply a myth, but the truth is that the Rasakinda is a tremendously beneficial plant to have in your home garden because of its range of health benefits. “It is a beautiful vine easily grown in home gardens and it grows upon trees/plants while doing no harm to the tree/plant. It is able to take in air and water through long aerial roots. At a mature state the Rasakinda plant can grow towards the ground and plant itself in the soil (while it is still attached to the host tree/plant). So if a part of the stem of the vine (Rasakinda) is cut off and thrown onto another tree/plant, it grows as a separate plant on the new host tree/plant. So the new vine grows aerial roots. Rasakinda has greenish leaves and can perform Photosynthesis. When you wish to create more Rasakinda plants, obtaining a fresh sample of stem is advisable,” said Hapuarachchi. When you cut a small part of the vine (Rasakinda) and peel off the outer layering and chop it up and then you get the juice. The juice/nectar is bitter in taste but it has a vast range of medicinal uses. If you want to propagate, you cut off a stem cutting around one foot (from the Rasakinda vine) and place it on another tree and it will grow attached to the host tree. 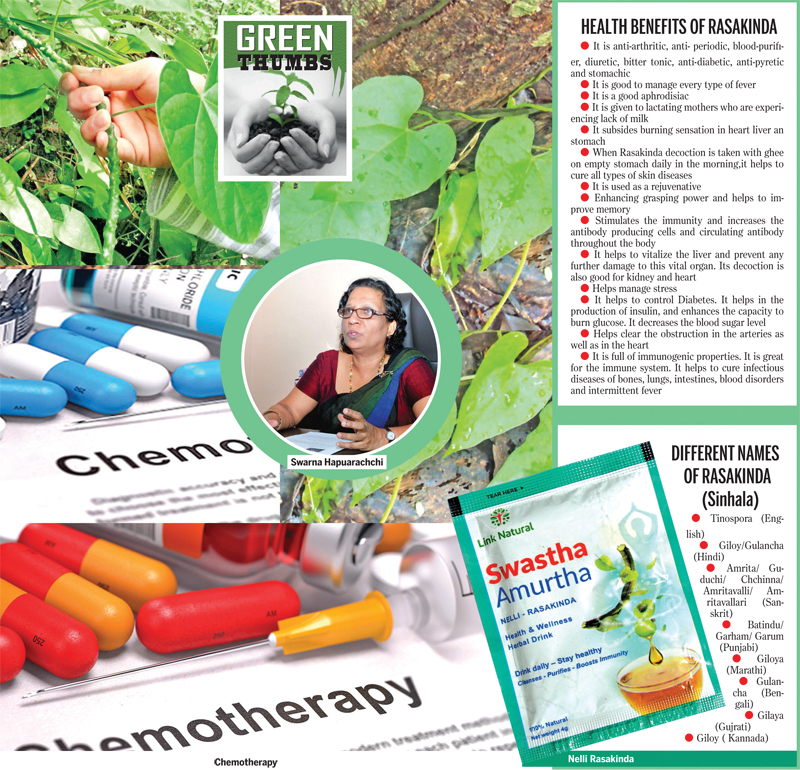 “Rasakinda is very good for cancer patients. One teaspoon is enough for older patients. It is also good for maintaining the body’s luster and preventing skin diseases. It is also a brain tonic and is especially good for fever. It is good to manage Diabetes. Rheumatoid arthritis in addition to affecting your joints can damage a variety of body systems, including the skin, eyes, lungs, heart and blood vessels. Rasakinda can help with this condition,” pointed out Hapuarachchi. Nelli and Rasakinda together is a fantastic potion as Hapuarachchi points out. Nelli and Rasakinda boiled in water are a combination that is good for treating burning sensations in the body and cooling the body. This combination is well known. The powder is also developed through machines and is available in the market. “Rasakinda is good to maintain youthful vigor, and is good for cancer patients and is recommended for those with heart diseases, improving immunity. It is an appetizer and good for curing fever. Again Nelli Rasankinda is highly recommended for preserving one’s health. Rasankinda has plenty of anti-oxidants. If you have suffered from Jaundice it is good to drink Rasakinda. If the patient is bedridden or debilitated one teaspoon can help daily,” added Hapuarachchi. Rasakinda can be easily grown in home gardens and is essential for home gardens. However Hapuarachchi pointed out that there are a few side effects. It might decrease blood sugar. Diabetes medications are also used to lower blood sugar. When taking Rasakinda along with Diabetic medication can cause your blood sugar to go too low. That is the danger. If you are taking anti-diabetic drugs you should consult an Ayurvedic doctor. “When you are going under chemotherapy and radiotherapy, if you take the juice Rasakinda, the side effects of the chemotherapy and radiotherapy is reduced. Sometimes under such treatment the side effects can be distressing. Rasakinda makes the treatment manageable,” said Hapuarachchi.